What are Certified Diamond Engagement Rings? All engagement rings or diamond rings purchased at a certain size, and level of colour and clarity will generally be provided with a diamond grading certificate, or report, as it is often referred to. This may be produced by one of many laboratories around the world. Generally certificates for diamonds above J / SI2 and above 0.30cts in weight (our criteria) are automatically provided, and these paper reports, usually laminated, are produced in various sizes, with varying degrees of detail. The simplest are the “credit card” sized reports on rigid plastic often favoured due to the lower cost of producing the report, largely down to a smaller amount of information contained on the card. 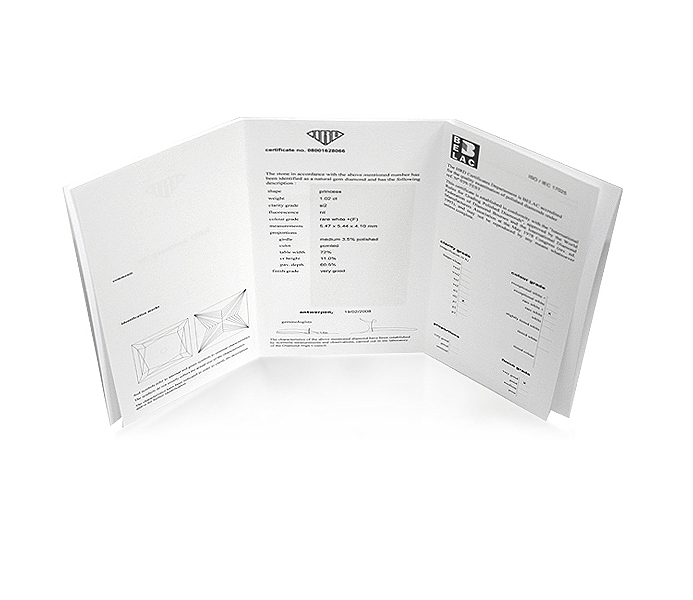 The next size of diamond certificate, is the portfolio sized report, which is a more regular size of diamond grading certificate. Many of our engagement rings are provided with this type of document, which has all of the relevant information as briefly noted below. The report opens out, and is a similar size to a typical passport. This size is easily stored away, and duplicates can be produced at further cost should such a document be lost, provided the certificate number and details are noted. The third size of report, often provided for the diamonds we set into diamond rings and engagement rings, is the full A4 size of the report. This folds into three, to produce a sleeved folding document that usually is supported by a diamond map, noting any inclusions or surface marks where applicable. These are a more expensive report, but probably the most detailed and comprehensive reports available for diamond grading. 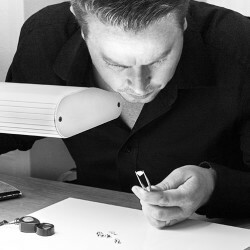 Most diamond grading laboratories offer this size of report, but when purchasing Ready-certified diamonds on the worldwide diamond market, there is never really any consistency with which report is provided and this is often only available upon request or when we purchase the diamonds ourselves. The information however, along with the diamond itself allows us to carefully select the best diamonds, that have a minimum of a very good cut grade as standard for the level of cut that we work with. The information contained on a GIA diamond report, or certificate, normally consists of the following information. When engagement rings are sent out, they are accompanied by this report, where present along with the valuation which also makes reference to the certificate details, this being an extra record of the cert. number and diamond grading details. Where smaller sizes of diamond are provided in rings, the cost of certification is a larger proportion of the stone cost, thus negating the need for certification on the basis of cost. This however can be arranged by request at additional cost. Especially where multi stone rings are considered, an individual diamond grading report for each diamond would inflate the ring price enormously where several diamonds were set into the ring. For more information on certification, please also look at our diamond certification page, or contact us for details.